As the cuts get rolling, this thread is where they will be posted, so be sure to hit “refresh” quite often for the latest news. – CB DeAndre Wright is the first to go. He is not expected to get a practice squad spot. 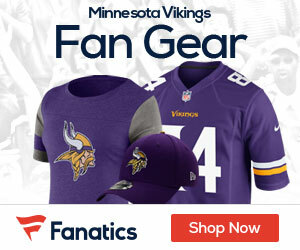 – Twitter is buzzing that Greg Camarillo will return punts for the Vikings with Darius Reynaud being traded to New York. – Housh wants to be a Viking now, but it sounds like the Vikes are not interested… yet. – Vikes have released tight end Garrett Mills. – Housh has been released by Seattle. Favre would have liked to see Mills stick around. – 18 players left to be cut. – Fullback Ryan D’Imperio is gone. A likely candidate for the practice squad. Looks like Tahi is safe. 17 to go. – Hearing that both WR Freddie Brown and RB Ian Johnson are going to get cut, with hopes of getting them through to the practice squad. – Leinart will be cut today. I am sure some Vikes fans will be calling for the team to sign him, but I disagree. – Sounds like the Vikes plan to keep four tight ends: Shiancoe, Kleinsasser, Dugan, and Shuler. – I get two wrong in a row: Vikes have waived Marcus Sherels. Probably going to go after a free agent CB now for sure. – Sounds like center Jon Cooper is safe. – D-Lineman Tremaine Johnson has been waived. He had a great week four preseason game. – Cuts are coming fast now. Refresh often to stay current. – As expected, Ian Johnson is out. Too bad a trade partner wasn’t found for this kid. – Rumor has it that the Rams have jumped in as a potential trade partner in the Vincent Jackson saga, according to PFT. Brandon Stokley waived by Broncos as well. Neither guy should even be considered a candidate to join the Vikes. – 14 cuts left… if my counting is correct. – Looks like Freddie Brown is officially cut now. – Mike talked with Albert Young today. Great interview, check it out in the below post! – Guard Thomas Austin is now waived. No surprise there. – The most obvious cut of the day: tackle Chris Clark has been waived. – Cornerback Nathan Vasher cut by the Chargers. Some fans wanted to see him in purple earlier this offseason. Could be a band-aid. – Titans release CB Tye Hill, who that Vikings showed interest in earlier this offseason. – WR Logan Payne and DE Mike Montgomery are both waived. Payne’s exit opens the door for Javon Walker to remain on the roster. – Guard Adrian Battles is also waived. – Eight cuts left until they hit 53. – Rookie linebacker Nate Triplett is gone as well. – After getting a $200,000 signing bonus from the Vikes, they may try and get him on the practice squad. He is subject to waivers, however. – I didn’t think that bth Javon Walker and Logan Payne would be cut, but they are. Something cooking with Housh? – Vikes already have a full slate of draft picks in 2011, plus the fifth rounder from the Sage trade. Another possible two compensatory picks no higher than the fifth round for losing Chester Taylor and Artis Hicks. 10 picks by my count, should be a fun draft year. – Drew Radovich is waived, looks like it is down to Pat Brown and Ryan Cook at OT. – Take this with a big grain of salt: Fox6 (whoever they are) have tweeted that the Vikes have signed Housh. – 5 cuts left with under an hour to go. – FOX6 is based out of Milwaukee and many others are working to confirm that Housh has signed. Stay tuned. – FOX9 is now reporting that Javon Walker was told that he was cut to make room for Housh. – Judd Zulgad says nothing has happened between Housh and Vikes and that Housh will talk to multiple teams, possibly to include the Vikes. – The Vikings are denying that Housh has signed with the team. – The Steelers released center Justin Hartwig, and the Eagles released center A.Q. Shipley. – Final list of cuts available in the next post. Hard to take issue w/ Adam’s 53 I would point out that Chilly has usually cutdown to 52. Speculaton only – I’m still expecting to see a Defensive Line trade. And there could be a major shakeup w/ Edwards or even Phat Pat. If we assume Adam’s 53 is in fact correct, and I think we can agree that he is probably not off by more than 2 or 3 guys. Seeing that Reynauld was a running back, would you have cut one of the other three and kept Reynauld? Or carry 4 running backs and cut somewhere else? What would have been your move? I would have cut Young, personally, despite the fact he is the most immediate and logical choice to backup Peterson. I would have kept Reynaud as punt returner/4th rb. And I think Adam hadm 10 d-linemen so we could cut one there or just go with one kicker, Longwell. Interesting. I would keep Al Young for his ability to protect the QB on blitz efforts. At least he has experience in the scheme. If AP gets hurt, now you have Toby a rookie and Reynauld a wide receiver (naturally) protecting a broken down old QB, on top of a line that has big questions. Freds was disappointed with Al this pre season however, guy had a great opportunity and seemed to waste it two yards at a time. Johnny which lineman, be specific. Doubt it Wayup. Bellicheat drafted two tight ends in the first 4 rounds this year, they both are very good. Freds was hoping the Vikes would sneak away the Hernandez. Bet he moves Hernandez out to WR. A Justin Hartwig C (Steeler) for Jamie Mitchell or Freddie Evans trade makes a lot of sense. Disagree with those who think Everson Griffen needs a roster spot. Someone may pick him up before he hits practice roster. Is he more than another big name college guy? Has anyone seen anything out of him? I just saw that the Titans waived safety Myron Rolle….He was the shiz with FSU but does anyone know how he looked during preseason? Oh God we are stuck with Tahi again, bummer. I will not be one calling for Leinhart to join Vikes but you never know with Childo. I think you right on Leinart Adam – I hope he gets a shot somewhere but I can’t see him playing in Minnesota – not with this team anyway . . . so he’ll probably be in purple by Monday . . .
Freds would love to sign Leinart. He tackles like your old pal Fragile and could score a ton of hot chicks for Freds next boat excursion. Pretty selfish there Freds. I expect a written invitation to Freds next boat excursion. Ole, you’re a sick man, very sick. Do Lloyd’s kickoffs really make a difference? If your main kicker can’t get in the end zone are you missing the boat anyway? I think it’s a waste unless he can kick em out of the end zone. Why did it take so long to cut Chris Clark? That’s the no brainer of the day. Freds are you feeling alright? I’m with Johnny, Are you ok old pal Freds ??? Matt Leinart, I don’t think so, Haven’t we been torchered enough!!! The best think childo has done so far is shaved that mop of the front of his face !!! Childo better be careful here, Favre wanted Mills and Walker. Are the Eagles releasing any veteran WRs today? Hope they didnt sign DOUSH. Cant stand that guy. Cal, it does make business sense but the guy will never win any personality contests. Just something about him that I despise. sorry…….Housh has legs. Javon doesn’t.